Also these days she likes to feed herself! Before whenever I feed food, she will cry and try to get the spoon from me, but that is for playing with the spoon. 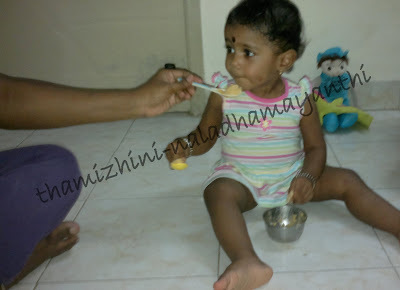 But these days, she gets spoon from me and she only takes little bit of food in the spoon and eats herself. Growing up......!!! See, how I'm holding this ball! 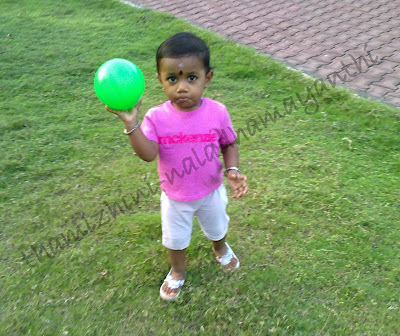 I was surprised to see her with three balls in her hand. They were small balls, but still she holds all three in one hand. She watched how we hold them and she did the same. 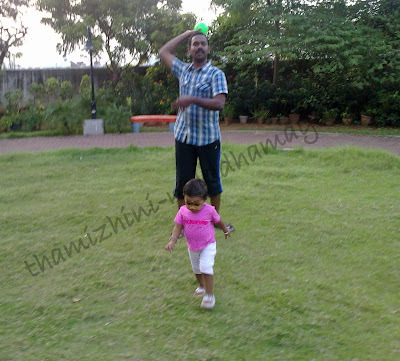 It was really a amazing scene to see her with three balls in one hand and more over, we used to get laugh by seeing her when she tried to hold them without leaving even one of the balls to ground. Play time with Appa... Once in a Blue Moon!!! We use to show Thamizhini to the mirror after she dressed up in the morning. She likes to see herself and I often wonder what this little one might be thinking by seeing the image on the mirror. So now it is routine habit and whenever she dressed up, she herself go to mirror and sees herself. Hey! How my cap and booties look? As I said earlier posts, she likes to read her book now and then. She always roam here and there and finally settle down with a book in hand which is right under the TV table. She knows almost all of her book names and if we say names, she get it to us. So this was very useful for us to ask some of the things which we need. 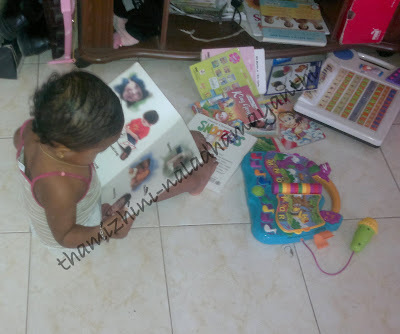 She likes to see the "Activity book" and from that only she learnt how to kick the ball. 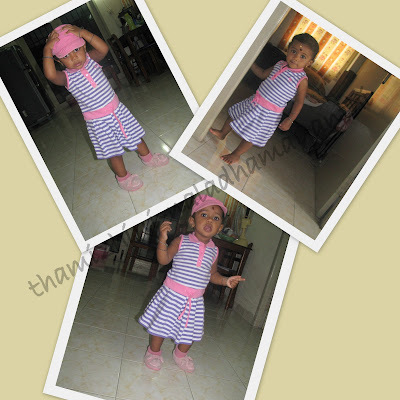 She says like, smiling, eating mammu, running, bathing by seeing the photos. I Like to mess up, but I never like to clean it up! Now she is able to play see-saw without our help. 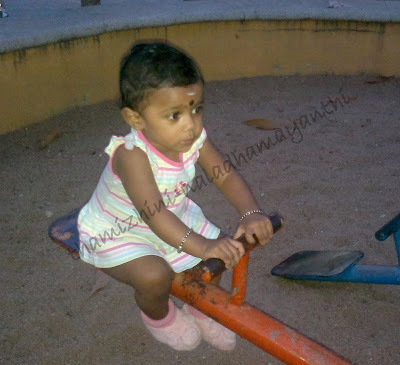 She holds the bar tightly and sits properly for playing on this. But the problem here is, she never understand the causes of falling down. What I mean is, if she does not like to play anymore on this, she tries to get down and never worried where the sitting bar is. If she want to come out, it has to happen in a next second. So we have to pay full attention on her when she plays.